Germany Realizing the Truth, About the Wind Scam! German manufacturers – and other energy intensive industries – faced with escalating power bills are packing up and heading to the USA – where power prices are 1/3 of Germany’s (see our posts here and hereand here). And the “green” dream of creating thousands of jobs in the wind industry has to turned out to be just that: a dream (see our post here). 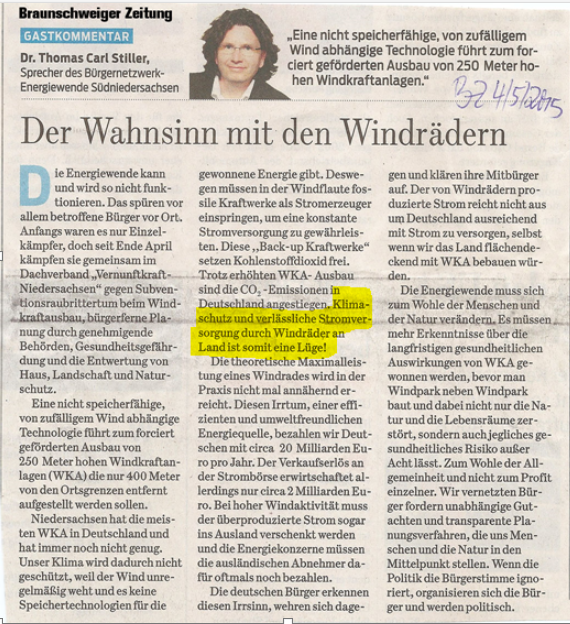 Now, apart from unnecessary wind farm harm, Germans are fast waking up the unassailable fact that wind power is not only insanely expensive, it’s utterly meaningless as a power source. Here’s a couple of recent pieces from Deutschland, that detail the scale of the disaster and the German’s brewing hostility to it. Thirty years ago, he would have certainly been honored as “Master Architect of Socialism” or “Chief Activist of Socialist Labour” – east of the Elbe. Sigmar Gabriel is doing everything possible to re-establish a comprehensive planned economy in Germany: the green energy transition pushes the gates to energy-socialism far open. In fact, the new coal plan is just another step in the great socialist power master plan that Sigmar Gabriel is rolling out all over Germany. Already a whole republic of Green electricity councils establishes determined plan-prices, solar and wind comrades produce arbitrary amounts of power, the population pays compulsory levies, supply and demand are suspended and party politics determine plan fulfillment figures. In this eco-socialism, everybody who produces electricity from renewable sources receives a nationally defined “energy feed-in tariff” (the very word sounds like it comes from East Berlin) according to plan specifications. This has as much to do with free market prices for electricity as Stasi boss Erich Mielke had to do with the freedom to travel – nothing. What was once launched as a – well-intentioned – green energy revolution has now mutated into a giant VEB [i.e. East German state company]. In Gabriel’s system electricity production is no longer determined by demand – as is usual in a market economy. It is not demand that determines supply – but the subsidy billions. Produced is only what wind and solar power and feed-in tariffs expensively allow, not what the public and the economy need – cheap energy. In Gabriel’s national energy system there is an ideological distinction between “good” (green) and “evil” (traditional) energy. Therefore, even profitable and clean gas power plants are switched off – as just happened to Europe’s most modern gas-fired power plant in Irsching. Instead, new subsidy-fed projects are connected to the grid without the necessary network capacity and without the necessary storage technology. For these intermittent power plants, coal power plants have to be kept running as backups, which in turn emit a lot more CO2, which now are also extra-taxed. It all feels like socialist self-perpetuating: this energy revolution cannot be stopped. The eco-guaranteed prices already lead to all sorts of classic features of a planned economy all of which are well known from the Soviet bloc economies: unprofitable excess capacity, for example. Meanwhile, 1.4 million photovoltaic panels have been installed in the rather shady Germany. No other country in the world has built up such a tremendous and wholly unprofitable contingent. With around 25,000 wind turbines as well as thousands of biogas plants we are world leader. Like in the five-year plans of the socialist German Democratic Republic, quotas, objectives, and targets are prescribed by central ministries. The new eco-planned economy devours vast billions in subsidies, not less than 22 billion euros total EEG feed-in tariff per year – and yet electricity from renewable sources, even after more than ten years of continuous subsidies, is more expensive than that from coal, oil, nuclear energy and gas. Rather than terminate the subsidy socialism, however, a parasitic mix of funding application experts, investors, plant manufacturers and subsidy distributers continues to drive the industry forward. They have created an eco-industrial complex, which performs perfect lobbying in Berlin, but which also ruins the country with windmills and fleeces it with collective money, because on top of that the Kreditanstalt für Wiederaufbau (Credit Bank for Rebuilding) grants the green lobby subsidised loans to ensure that the planned economy is also financially rounded. The wrong-headed system is so expensive that only a very rich country like Germany can afford this large-scale experiment. Around 100 billion euros have already been burnt by this subsidy socialism. Currently the green energy levy costs 56 million euros every day. The expanding eco-socialism has turned energy providers to state combines of the Federal Grid Agency. Because this agency determines which prices may be charged for electricity transmission, it allows subsidies and authorised returns on investments. Because the industrial electricity prices are the second highest in Europe, energy-intensive businesses are gradually saying good-bye to Gabriel’s energy-socialism. The fact that the colossal construction of wind turbines and solar installations also causes dramatic landscape blight is the sad irony of this green story. A journey through Gabriel-Germany is now like a green tunnel of horror, a roller-coaster ride through vast tracks of destroyed nature, a subsidy-grave filled with turbines and panels. That’s why – rather than chasing coal off the market too – the green command and control economy needs to be reformed fundamentally. It has set in motion the biggest rip-off subsidy of recent history and has damaged the environment, it burdens the economy and forces all consumers to suffer from rising electricity prices. The worst distortions of the market have to be balanced by more and more new regulations. In this way, one government intervention justifies the next. Germany’s ‘real existing socialism’ has been history since 1989, thank God. The energy-existing Gabriel-socialism, however, is on the rise. 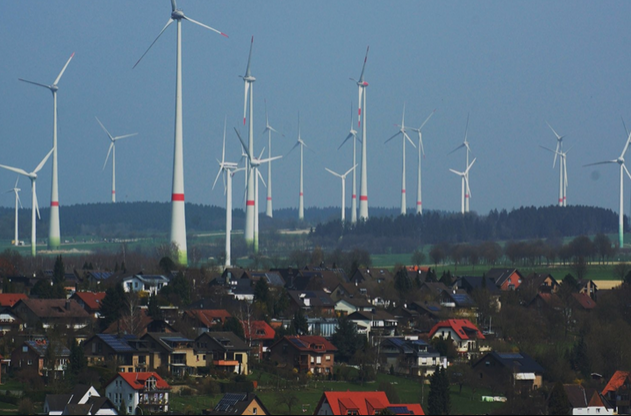 Part of what’s got Germans up in arms is what the wind industry has done to their beloved towns and country-side (for a pictorial taste of the aesthetic destruction – see this article). And the Germans are not taking what the wind industry has dished up, lying down: they’re getting angrier and more organised by the day. “German citizens are waking up to this insanity”. He comments that “wind energy would not be able to supply the country even if the entire country were covered with wind turbines”. Faux-green, fighting wind turbines, Health, Noise & Infrasound, not financially feasible, Return to sanity! ← The Left Uses “Climate Change”, as their “New Religion”!